It’s by Vladimir Suchy, Czech Games, it’s no 877 on the Geek, and the cover looks like a naff jigsaw drawing. Chris had mentioned it and so I’d signed up to join him playing his mate, James’s copy. It’s got several auctions although coins and science to bid with are very tight. Then there’s some tile placement for the towns and cities and connecting rail tracks you’ve won. Each tile depicts some countryside with a town or two/three and comes with some waste that you need to get rid of by owning a recycling centre or two (or eight if you’re James), plus a worker to activate one of the towns. Each of which produces coins, science or victory points in various combinations. You can then grab a little bit of technological assistance, a bridge, train to help your workers move, or some flower-power parks or lakes, or other industrial units. Finally in each round you bid on the catastrophes; not collecting more waste or pollution. It was here I suffered badly, oh well! The other two fought out an intense land building regime having way more tiles than me. I thought their collections of waste might hold them back but they’d managed that very tidily. Scoring comes at the end of each of the 6 rounds and these can differ increasing replayability. The others commented that with four the competition impacts big time, their way of telling me I’d hardly been involved(! ), which was factually true. It was tight at the end, James had been about a dozen points up from the first round but couldn’t quite hold Chris off. I think there’s a decent game in here. I can imagine it would be tighter with more players. My problem was I fell behind early on and had no idea how to get back into the game. Would certainly give it another go. Final Scores; Chris - 140, James - 137, Neil - 96. Not sure about this one. It’s all a little bit too cute and I think I may have grown out of twee unless it involves listening to Belle & Sebastian. It was new to both Chris and James although on Chris’s ‘lookyoutlist’ for Essen so was happy to try and explain a few of the rules I’d remembered. Actually, it was this or Fleet and do I not like that! So, we started building our planets, mainly by picking anything but the scoring tiles which is daft really, you have no idea what you’re collecting that might score for you. Never mind. James picked up elephants and suns liberally, Chris looking at stars and me goats, trees, roses, goats, coffins, snakes, and goats, but no lampposts, oh no. Once we began picking up the scoring tiles things began to make more sense, and we’d all been doing ok with our white sticks. Chris and I managed to avoid giving James too many trees although he was way ahead on volcanoes. I stubbornly refused trees before realising I had no tree scoring tiles anyway. Damn. Scoring was close with those volcanoes impacting big time. Final Scores; Chris - 58, Neil - 54, James - 52. Neil, you’re in Sunny Hounslow I only live in Ealing come and get your copy, I’ll put the kettle on.. So off I went and picked up a beautiful wooden board and four sets of six dice, even being able to select some black dice to replace the green so that there wasn’t a horrible clash of canary yellow and green in the components. The coffee was perfect too. Gavin, the designer, then took me through a couple of rounds to explain how it plays. Plenty of flicking dice, much interaction and aggression can be useful. 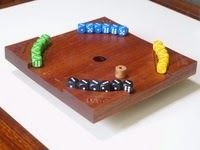 The board is a square chunk of wood with each corner having a lip that can hold your 6 dice. There’s hole in the middle of the board through which a die can fall. In the ‘Jam’ element of JamSumo you place one of your die on the corner lip, 4 pip facing up, and try to flick it through the hole. Each player does this with his 6 dice until one of them has got all through the hole. The dice left on the board score their face value as negative points. Any unplayed or dice knocked off the board score 4 each. Play as many rounds as there are players and see who’s scored the least. In the first two rounds I showed the boys how it was done getting rid of my dice both times, them scoring low in the first round and high in the second. By the time the final round was done Chris had things sorted and James and I both scored high. I’d just held on from Chris though, 12 - 13 - 18 for James. You then switch your 6 dice to a 3 and stack them against the lip for the ‘Sumo’ element. This time you flick one of your die making sure it hits an opponents die attempting to remove their dice from the board. You score positive points for all remaining dice, scoring the face up value. This is where the aggression comes in and where my children have fallen in love with the game. James set off well in the first round with me being blitzed off. Chris and I managed to get back into it in the next round and so all to play for in the final round. This is where Chris suddenly discovered he has no flicking ability whatsoever. James mentioned his years of flicking Subbuteo players around and I naffed up. James walked it, 12 - 10 - 8. I love this game, and you know how I feel about dexterity, dice, and that stuff. 7 Wonders, Intrigue, Settlers of Catan, Nanuk and Splendor. Sorry you out muscled Neil, but it definitely needs more than one play to understand the impact early decisions will have later. I very much like it. I also won the game of Coup we had, so all in all a decent showing from me (as long as flicking dice is ignored).